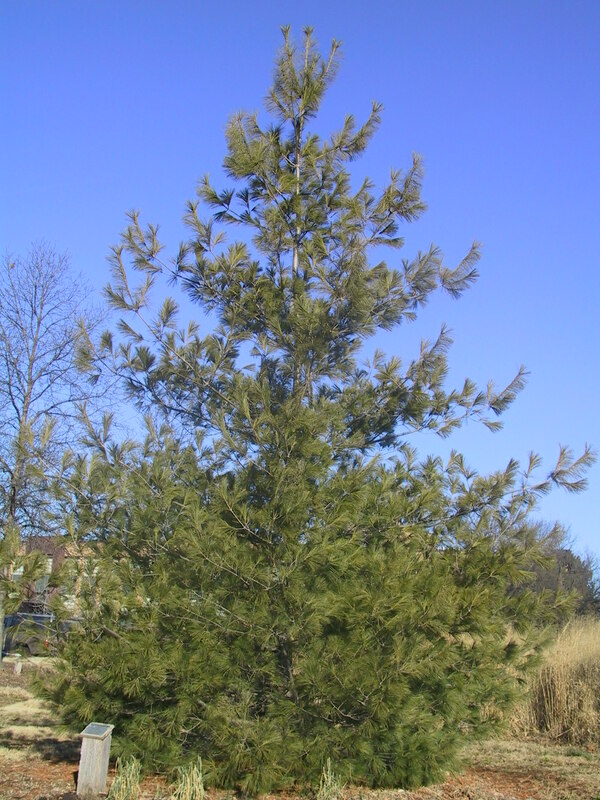 Eastern white pine grows on a variety of soils ranging from light, sandy to heavy clay. If possible, plant on east or north facing slopes where soils stay cooler and retain more moisture. The tree will grow well on most eastern Nebraska sites as long as drainage is good. As with most evergreens, it is good to plant white pines in groups but it can be planted individually as a specimen tree. Narrow-growing cultivars have been developed and are often used as visual screens. White pine does not like to have “wet feet” or standing water around its root zone. However, it is more tolerant of irrigated lawns than most other pines. Although the tree is tolerant of moderate drought, it will likely suffer in severe droughts if not sited properly or watered. Eastern white pine is the largest conifer of the eastern and upper Midwest forests, reaching 150 feet in height and up to 40 inches in diameter. In dense stands, trees produce tall, cylindrical stems with pyramidal-shaped crowns, characterized by distinctive, plate-like branching, especially noticeable as the trees become older. Open-grown trees can become quite wide over time. On young growth, the bark remains rather thin, smooth, and greenish-brown in color. On older trees, the bark becomes deeply fissured and dark grayish-brown in color. The needles are in clusters of 5, soft, flexible, 3-5” long, and bluish-green in appearance. Its cones are about 4 to 8 inches long and 1 inch thick. These remain attached for 1 to several months after ripening in the autumn of the second season. It has fair wildlife value. Gray and red squirrels, deer, mice and 16 species of songbirds have been known to eat the seed. Eastern White Pine is one of the most widely used timbers for construction lumber in the northeast United States. The wood is light, durable, and easy to work. The long, straight trunks were once prized for use as ship masts. In favorable locations, white pine can grow quite well. It is, however, susceptible to a variety of insect and disease problems. Blights and rusts are the main diseases, with its most dangerous enemy being white pine blister rust which is a bark disease that is usually fatal. Currants and gooseberries are the alternate host for white pine blister rust and should not be planted in areas where white pines are under attack. In Nebraska, white pine often fails to thrive in the landscape with exact causes not being known. Most likely, our hot and dry summers are the culprit. Domingo pine (Pinus strobus x ayacahuite ‘Domingo’) is a hybrid between eastern white pine and a Mexican white pine showing good adaptability in eastern Nebraska and with better heat and drought tolerance than the eastern species. Southwestern white pine (Pinus strobiformis) is a southwest US native similar to eastern white pine, but growing about 2/3 as large (up to 50’ tall and 30’ wide). It is more heat and drought tolerant than its eastern cousin and thus a better choice for planting in south-central and western Nebraska. Swiss stone pine (Pinus cembra), native to the European Alps, is a slow-growing, medium-sized pine with a blue-green color. As with other stone pines, its cone seeds are edible and consumed as food in Europe. Several cultivars are available commercially and it is showing good promise across much of Nebraska. Korean pine (Pinus koraiensis) is native to east Asia from Korea north to Russia. It has blue-green needles and attractive flaky bark growing up to 50’x30’. Korean pine is known for its edible pine nuts that are a staple in the Asian food market. Japanese white pine (Pinus parviflora) is a medium-sized tree (up to 35’x25’) that develops an open, rounded habit with tufted branches bearing many large, attractive cones. Himalayan pine (Pinus wallichiana) is native to the Himalayas of Afghanistan and showing good promise in the Midwest. It is very similar in appearance to eastern White Pine. Lacebark pine (Pinus bungeana) is a slow growing species from China known for its beautiful mottled bark and multi-stem habit. Unlike other white pines, it has needles in groups of threes. It is prone to pine wilt disease so should be used with caution. Eastern white pine is the state tree of Maine and Michigan. Because of the tree’s prized use for ship masts, the king of England decreed reserving the best of these trees for use in the British navy which played a significant role in the events leading up to the Revolutionary War.